the Pittsburgh Parks Conservancy and has guided the public-private partnership’s strategic vision since its inception in 1996. Under her leadership, the Conservancy has undertaken a comprehensive master plan for Pittsburgh’s parks system, raised more than $105 million, and completed seventeen major capital projects. Distinguished Daughter of Pennsylvania, she has been honored by the YMCA of Greater Pittsburgh with the Allerton Award for Lifetime Achievement and the Woman of the Year in the Environment award. 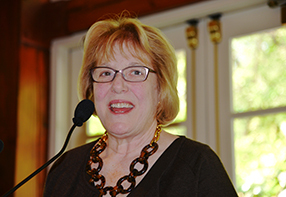 Meg Cheever is the Founding President and Chief Executive Officer of the Pittsburgh Parks Conservancy and has guided the public-private partnership’s strategic vision since its inception in 1996. Under her leadership, the Conservancy has undertaken a comprehensive master plan for Pittsburgh’s parks system, raised more than $105 million, and completed seventeen major capital projects. Cheever has served on the boards of the City Parks Alliance and the National Association for Olmsted Parks. In addition to being named a Distinguished Daughter of Pennsylvania, she has been honored by the YMCA of Greater Pittsburgh with the Allerton Award for Lifetime Achievement and the Woman of the Year in the Environment award.